Lord Kelvin (William Thomson, 1824-1907) was a brilliant scientist and an innovative engineer. His honorific name is forever linked to the absolute temperature of zero degrees Kelvin. His work often called for all sorts of variables to be measured. Here’s what he once said, “…when you can measure what you are speaking about, and express it in numbers, you know something about it, but when you cannot express it in numbers your knowledge is of the meagre and unsatisfactory kind…” Lord Kelvin’s view struck a chord with me because of the Dutch truism, “Meten is weten.” It translates into something like, “To measure is to know.” It may have messed up a perfect rhyme but didn’t impact good sense. It’s a leitmotif in my life! Lord Kelvin knew all about degrees Kelvin and degrees Celsius. But he couldn’t have been conversant with degrees of freedom because Sir Ronald A Fisher (1890-1960) was hardly his contemporary. Lord Kelvin might have wondered why geoscientists would rather assume than measure spatial dependence. Sir Ronald A Fisher could have verified spatial dependence by applying his ubiquitous F-test to the variance of a set of measured values and the first variance term of the ordered set. He may not have had time to apply that variant of his F-test because of his conflict with Karl Pearson (1857-1936). It was Fisher in 1928 who added degrees of freedom to Pearson’s chi-square distribution. Not all students need to know as much about Fisher’s F-test as do those who study geosciences. The question is why geostatistically gifted geoscientists would rather assume spatial dependence than measure it. How do they figure out where orderliness in our own sample space of time dissipates into randomness? Sampling variograms, unlike semi-variograms, cannot be derived without counting degrees of freedom. So much concern about climate change and global warming. So little concern about sound sampling practices and proven statistical methods! I derived sampling variograms for the set that underpins A 2000-Year Global Temperature Reconstruction based on Non-Tree Ring Proxies. I downloaded the data that covers Year 16 to Year 1980, and derived corrected and uncorrected sampling variograms. The corrected sampling variogram takes into account the loss of degrees of freedom during reiteration. I transmitted both to Dr Craig Loehle, the author of this fascinating study. Excel spreadsheet templates on my website show how to derive uncorrected and corrected sampling variograms. Spatial dependence in this uncorrected sampling variogram dissipates into randomness at a lag of 394 years. 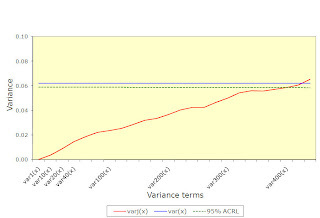 The variance of the set gives 95% CI = +/-1 centrigrade between consecutive years. 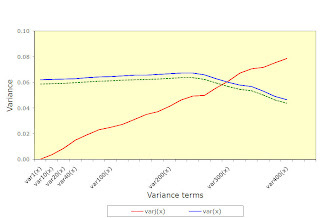 The first variance term of the ordered set gives 95% CI = +/-0.1 centrigrade between consecutive years. Spatial dependence in the corrected sampling variogram dissipates into randomness at a lag of 294 years. It is possible to derive 95% confidence intervals anywhere within this lag. Sampling variograms are part of my story about the junk statistics behind what was once called Matheron’s new science of geostatistics. I want to explain its role in mineral reserve and resource estimation in the mining industry but even more so in measuring climate change and global warming. Classical statistics turned into junk statistics under the guidance of Professor Dr Georges Matheron (1930-2000), a French probabilist who turned into a self-made wizard of odd statistics. A brief history of Matheronian geostatistics is posted on my blog. My 20-year campaign against the geostatocracy and its army of degrees of freedom fighters is chronicled on my website. Agterberg ranked Matheron on a par with giants of mathematical statistics such as Sir Ronald A Fisher (1890-1962) and Professor Dr J W Tukey (1915-2000). Agterberg was wrong! Matheron fumbled the variance of the length-weighted average grade of core samples of variable lengths in 1954. Agterberg himself fumbled the variance of his own distance-weighted average point grade in his 1970 Autocorrelation Functions in Geology and again in his 1974 Geomathematics. Agterberg seems to believe it’s too late to reunite his distance-weighted average point grade and its long-lost variance. I disagree because it’s never too late to right a wrong. What he did do was change the International Association of Mathematical Geology into the International Association for Mathematical Geosciences. Of course, geoscientists do bring in more dollars and cents than did geologists alone. I’m trying to made a clear and concise case that sound sampling practices and proven statistical methods ought to be taught at all universities on this planet. Time will tell whether or not such institutions of higher learning agree that functions do have variances, and that Agterberg’s distance-weighted average point grade is no exception!